I have to admit, I was never a bread person. Given the chance I would choose to eat pasta and noodles all day followed by rice. However, as you get older, your preference changes. While I still love my pasta and noodle dishes, I've also learned to appreciate having a sandwich as a meal. What more when I was introduced to all the delicious combinations and bread options there is. I love croissants most especially the wholemeal kind, bagels are also something I'm really fond of and the more unique the bread is, the most inclined I am in trying it. However, nothing beats our local Pan de Sal filled with a wide-variety of spreads one can think of. So, one lazy Sunday, Paul and I decided to check out Tiong Bahru Bakery with my dear Mommy who came to visit us for the weekend. Mommy, as you all know, is a very healthy and simple eater. She doesn't like anything creamy, deep-fried or overly sweet. So, when I told her about Tiong Bahru Bakery, I sold the idea by saying that we can split a sandwich and maybe try their coffee too. Well, that didn't quite happen as we ended up filling our small table for three to the brim. Oopsie! The scene inside the cafe was bustling with customers going in and out, families enjoying their Sunday brunch and couples spending their morning quality time over bread and coffee. Over to one side is the coffee bar where you can hear the espresso machine whistling. The aroma of coffee fills the air mixed with the buttery smell of freshly baked bread. 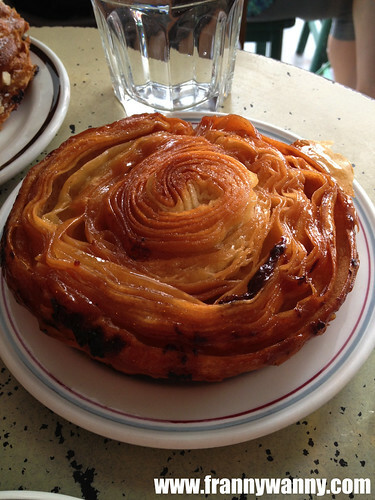 Tiong Bahru Bakery is one of the more popular coffee shop / bakeries here in Singapore as people have been raving about the delicious bread creations of French pastry chef, Gontran Cherrier. Everything about Tiong Bahru Bakery was something that both Mommy and I love so you can just imagine how excited we were as we headed to the counter to place our orders. My Mommy never fails to surprise me. 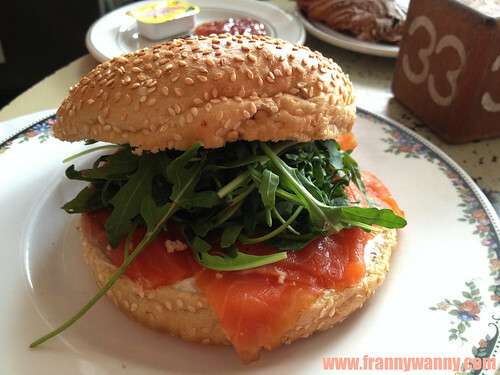 Anyway, the Molasses Bun with Salmon was DELICIOUS! Filled with crunchy and really fragrant arugula, the smoked salmon was just so good that I can't help but smile at the mere thought of it. The cream cheese wasn't too overpowering and instead perfectly complemented the salmon and arugula. As for the Molasses Bun, no it wasn't sweet at all but it was pillowy soft that you'd fight the urge to bury your face into it. I highly recommend this. We also had the Chocolate Almond Croissant (S$4) which sadly paled in comparison to the two stellar breads that we had. It was soft yet flaky however I would have wanted it more chocolate-y. I guess Mommy got really excited at the sight of the bread counter that she couldn't help but to also try the Mozzarella Bread. Sadly it failed our expectations as the bread was too tough to be sliced into half and it was quite chewy for us to enjoy fully. 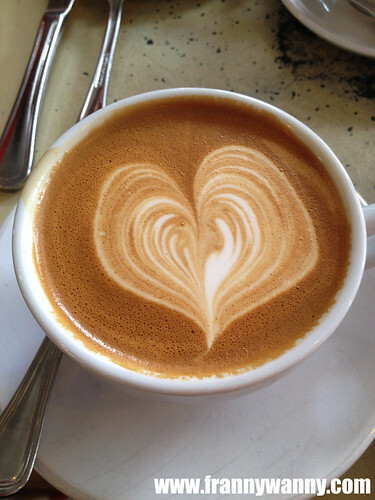 To go with our bread, I got my all-time favorite Flat White which was sweet, creamy and delicious. The coffee was very fragrant and Mommy couldn't help but rave about it in between sips of her Long Black. 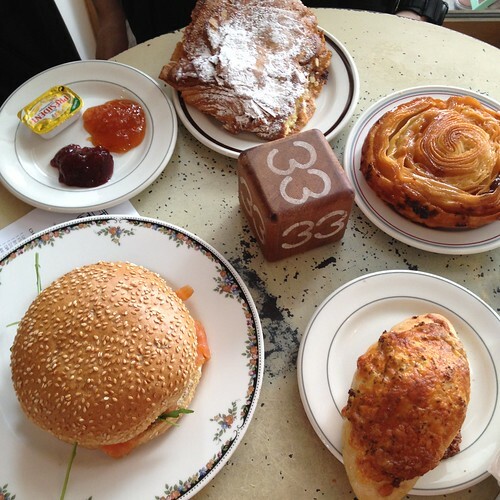 We'll surely take Pan and Papa to try Tiong Bahru Bakery when they come to visit too as they'll surely love it as well. It was a nice place to spend your weekend brunch as the neighborhood gives a very relaxed vibe as you watch aunties walking around with their market trolleys, families enjoying the weekend sun and (to my horror) pigeons flying around the area too. Admittedly though, the main branch at Tiong Bahru may be a bit hard to find so for those who will be staying within the city, they have a branch at Raffle City Shopping Centre and in TANGS Orchard too. Whether you're living here in Singapore or you're here for a visit, this is one place you should not miss. 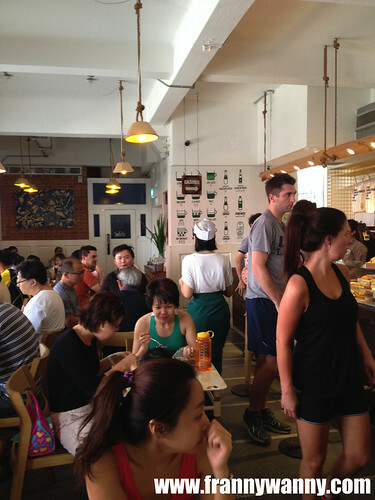 Check out Tiong Bahru Bakery at 56 Eng Hoon Street #01-70, Singapore. Click here to visit their Facebook page.